Add 3 million colours to your home cinema | What Hi-Fi? If you can't help thinking something is missing from your home cinema room, how about adding some ambient lighting capable of delivering "3 million different colour shades"? The Revoltec Backlight System offers just that. 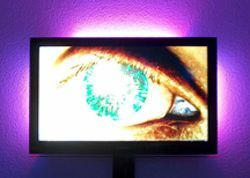 The SMD-09 system is a backlight kit for a TV, with two 23cm SMD LED tubes - expandable up to six tubes – that can be remotely set to any of the three million colour shades. With more than a nod to Philips' Ambilight system, there are various lighting effects and speed settings that can be set, plus a choice of seven customisable colour presets. Revoltec also suggests you could add the lights to furniture or other AV kit. Available from Amazon, there's also an SMD-15 system, which sports larger LED tubes. Both packages include an infrared receiver, remote, mounting clips and attachments. The Revoltec Backlight System SMD-09 is on sale for around £35, the SMD-15 for £45.